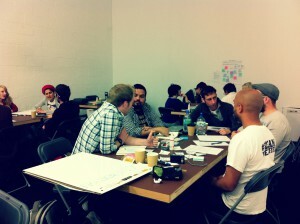 Design Jams are one day design sessions during which people team up to solve engaging UX challenges. While conferences and talks are very popular in the UX community, there aren’t many opportunities for actual collaboration, like the “hackdays” enjoyed by the development community. Design Jams get people together to learn from each other while working on actual problems. Saturday 16th we had a deisgn jam at Spike Island. The sessions champion open-source thinking and are facilitated by volunteer mentors. We were lucky to have some excellent mentors, Dan Williams (creative technologist at Pervasive Media Studio), Simon Levitt (creative technologist at Imagination) and Sjors Timmer (information architect at Sapient Nitro). Their task was to facilitate the groups in developing their ideas. How can we make a visit to an art gallery more compelling and rewarding? How can we engage audiences and start conversations? How can we help people connect with the art? If you’re especially interested in a particular exhibit or piece, what more information would you want to know about it? How could that information be presented? How would the information be collected in the first place? With many museums and galleries (like Spike Island), what is on exhibit is just a very small piece of what actually goes on. What if you could see through the walls? How would this be possible? At a recent talk at the Royal Society about ‘Why Science Matters’, Google CEO Eric Schmidt said something along the lines of “the arts/culture makes life worth living and technology enables this”. How? Consider a person who doesn’t regularly go to galleries or museums. How would they find out about what what’s going on and if there is something they would enjoy going to? How could we help this person during their visit? What would make them connect with the art, other people? What happens after this person leaves? What have they gained? What do they take with them and what do they do with this new experience/learning. 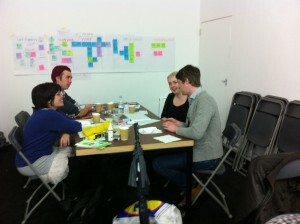 Normally Design Jams have an hour for dividing people into groups followed by team building. We did things a little differently, kicking off with a tour around Spike Island. I spent about 2 minutes dividing people into random groups, and we had 4 groups with 4-5 people in. Everyone was given loads of post-it-s, flip-charts, marker pens of various colours, and all the tea, coffee, fruit and pastries they could possibly want. After a playing an icebreaker game, they were told the challenge and everyone started brainstorming, researching and exploring. It didn’t take long before the first group set up to do some research around Spike Island, talking to the visitors, exploring the gallery etc. We had interim presentations where the groups presented their ideas so far, followed by questions and feedback. After lunch was the ‘Design phase’ were groups were encouraged to refine their idea, and do some wire-framing, UI exploration, storyboards, prototypes, guerrilla testing etc. The final presentations were filmed and will be available soon. Had a great time at #djbris the other day. Thanks to everyone that participated.